Fishing Article Minnesota's Cormorant Population Explosion. Are We Sitting On A Cormorant Time Bomb? 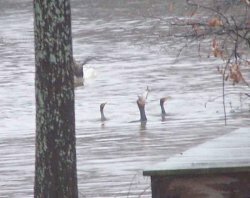 Keeping An Eye On Cormorants In Minnesota? Check this page for Articles and updates about bird management strategies and regulations as they unfold. Lots of useful links to research, articles and updates concerning Cormorant populations and their influence on fishing in Minnesota and North America. The comeback of the Double Crested Cormorant has been phenomenal. Formerly treated as a pest, the once threatened Cormorant enjoyed consideration as a species of special concern during the late 1960’s when persistent use of pesticides caused the decline of this and many other birds. Over the past 30 years, Cormorant populations have rebounded all over North America and throughout Europe. With no natural predators and continued federal protections, populations have continued to rise. Wherever significant populations of Cormorants exist, controversy about their impact on sport and commercial fishing is sure to surface. Northern Minnesota’s Cormorant population is one that has steadily increased and evidence of their presence is being felt by area anglers and resort owners. The question is whether we’re sitting on a fisheries management time bomb? Or if we can learn from the experiences of others and get a handle on this threat before we face another crisis? Take a close look at the Cormorant in the center, that's a filleting size fish it's guzzling down. Although they prefer smaller size fish, they'll eat whatever gets in front of 'em. Click for larger view. Photo courtesy of Sharon's Page, Birding on Cross Lake. Large Cormorant populations exist "under the radar" on a variety of popular waters in Minnesota. Seemingly un-noticed by wildlife and fisheries management officials, anecdotal reports by anglers, guides and resort owners suggest that there are sure to be more Cormorant stories to come. Although there are several areas in Minnesota and throughout the Midwest where evidence of Cormorant overpopulation is staring us in the face, Leech Lake has been one of the earliest to reach the boiling point and draw attention from anglers and fisheries management officials. For now, here’s one of Minnesota’s highest profile cases. Northern Minnesota’s Leech Lake like many other large lake fisheries, has enjoyed a reputation for great Walleye fishing over the years. But the habitat of Leech Lake has proven to be attractive not only for fish, but also to the Cormorant. With rocky islands that provide ideal nesting structure for the birds and plenty of shallow water feeding areas, Cormorant populations have risen to the level of around 2500 nesting pairs. After a half dozen years of steadily declining Walleye and Perch fishing, it’s become known that before you mention Cormorants to a lot of folks around Leech Lake these days, you better pack a lunch because you’re going to be there for a while. As a result of speculation about the severity of the problems associated with high Cormorant populations, Leech Lake Fisheries Managers were forced to take a close look at the impact of these birds on fish populations in Leech Lake. As a result of the preliminary research, The Minnesota Department of Natural Resources has undertaken a multi-faceted management approach that combines a highly restrictive protected Walleye slot limit, Cormorant reduction, Walleye stocking research and habitat management. It is hoped that the plan will achieve the goal of facilitating a natural recovery over the next several years. Most folks agree that reducing Cormorant populations dramatically will be the key to allowing any other part of the program work correctly. The problem is that Cormorants are highly efficient predatory fishing birds that can dive to depths of 30 feet or more and eat for about an hour each day. With each bird consuming around a pound of fish every day, even seemingly small populations of birds are consuming lots of fish. Just a few hundred Cormorants living on a lake will eat around 50,000 pounds of fish every open water season. On a lake like Leech where you have already Over 5,000 resident birds, it’s easy to figure out where the small fish are going. That’s 900,000 pounds of fish every single season! The most damning evidence, is the fact that Leech Lake still contains a fairly good population of larger "breeding size Walleye" but has virtually no population of small fish outside of the deeper waters of Walker Bay. It makes sense, in certain areas where the water is too deep for Cormorants to reach, these small fish still exist. In areas where shallower water makes fish easier to reach, small fish have virtually disappeared. Cormorants can’t eat the larger fish, so they remain in the system for a while. These larger fish are the key to facilitate a future recovery and therefore are the subject of a new protected slot limit to be implemented in 2005. Since Cormorants aren’t very selective about what kind of fish they’ll eat, it’s not accurate to assume that every single disappearing fish is a Walleye, Perch or any other particular game fish. They will eat any small fish that lives within their key feeding areas, so all fish from Minnows to Perch to Muskies are affected in some way by their presence. In the results of a study comparing the angler harvest versus Cormorant consumption on Lake Oneida – New York, Perch populations suffer more than do the Walleyes. In fact according to the study, Cormorants consumed an estimated 58 percent of Yellow Perch before age 10. Cormorants have affected Smallmouth Bass in Lake Ontario, Catfish in Southern commercial fish farms and Trout in Bavaria. The impact of the Cormorant is felt most in that they stand in the way of the lake’s natural ability to regenerate fish populations. The larger spawning age fish go to the shallows and spawn like they always have. But before the young fish can reach adult size, these birds that prefer the smaller size and larger concentrations of the smallest fish consume them. So before counting on any real chance of the lake recovering on it’s own, the necessary reductions in Cormorant populations must first be addressed. An article by Environment Canada, "winning the war against Cormorants", says; "the Double-crested Cormorant clearly demonstrates the "population explosion" phenomenon. This can be expected in any species occupying a large new habitat". In other words, we should expect populations to continue to rise much in the same way other exotic species expand to take over systems as they move in. As the birds in one system consume food supplies, they branch out to find newer un-tapped resources and the cycle begins all over again. The good news is that getting a handle on the problem is possible and has been accomplished in other areas. After a ten-year struggle against declining Walleye and perch populations, anglers on New York’s Lake Oneida are finally reporting that Walleye fishing is rebounding. One of the secrets was reducing the resident Cormorant population to about 100 breeding birds. In 2001 there was a strong year class of Walleyes and by 2004 catch rates had already risen from .24 to .81 Walleye per hour. That’s about on par with most of Minnesota’s well known Walleye lakes and demonstrates the effectiveness of the program. The Cormorant project undertaken as a joint program of the US Fish and Wildlife Service, New York State Department of Environmental Conservation and The US Department of Agriculture, plans to continue the effort to maintain the breeding population at 100 birds. Providing that the lake continues to produce a decent year class in at least one out of every few years, fishing should remain fairly stable for the next several years. So we know the problem exists and we can point to examples of where it’s been overcome. For us, it all boils down to whether our management officials are willing to go the distance in solving the overpopulation problems as they pop up. Let’s hope that Minnesota’s reputation for tackling projects head on will win out in the end and we’ll be able to maintain a balance that makes sense for all of us. With evidence pouring in from all over the world, we shouldn’t have to wait until each situation reaches crisis level before taking action. Leech Lake has long been one of my favorite Walleye Fishing lakes. Unfortunately, Walleye fishing has been extremely tough during the past few years and my visits have become increasingly less frequent. Walleye reproduction in the lake appears to be in trouble and almost all of the Walleyes that are caught by anglers are older, adult fish considered to be prime spawning size females. Young of the year Walleyes seem to disappear every year and it's been several years since there's been a year class adequate to generate a comeback. Opinions vary about the causes and the severity of the problems, but most folks are beginning to agree about one thing; The large population of Cormorants on Leech Lake has contributed to the decline and threatens to prevent a recovery from taking place. Since Cormorants target smaller fish, protecting brood stock now by initiating a protected slot size limit is unlikely to help because at this point, producing more young of the year fish is probably just going to provide the birds with more food and serve to perpetuate the problem. I've been trying to learn as much as I can about Cormorants during the past few months and after reading some of the studies, it doesn't take long to realize that this problem is not limited to Leech Lake, Minnesota or even North America. European anglers face the same problem, as evidenced by the articles, studies and links you'll find on this page. You be the judge, how can you control a population of predators that have no natural enemy? There are a lot of folks who depend on the health of this great lake for their livelihoods and we ought to do whatever we can to help Leech Lake and the folks who depend on it make a comeback. Even though Leech Lake is the focus of attention right now, it's just a matter of time before the over-population of Cormorants will be affecting many other lakes in our region. So in my view, getting a handle on the Leech Lake problem is going to give us a leg up on the problem throughout the area. Public comments are being accepted right now by the DNR, see the notice below. Doesn't look like too many birds in this flock does it? Try counting them and remember you're only looking at the ones on the waters surface. Each bird is eating as much as one pound of fish each day. This flock alone can take 50,000 pounds of fish in an average Minnesota summer. Here's a list of places to go for more information about Cormorants Use the information to learn for yourself. Two of the better sources are Rudstam study on Lake Oneida and The Canadian Wildlife Service Information from Lake Ontario. I'll provide additional links as they become available. Lake Oneida, New York - American Fisheries Society study of the comparison of fish harvests between anglers and Cormorants. PDF read only file. Click on this link and I can provide you a copy, but I do not have permission to re-print. American Fisheries Society - Follow this link to their home page. This link takes you to the following ARTICLE published in the "Tribune-Review". The town is not specified, but presumably in the Syracuse, NY area. The article has a "pro Cormorant slant", but includes some interesting statistics. Click on the link to go directly to the site that contains the article. Syracuse, NY (AP) - Ten men - three Lake Ontario fishing guides and seven avid anglers - pleaded guilty in the slaughter of as many as 2,000 cormorants, a federally protected bird with a voracious appetite for fish. In federal court Thursday, nine of the men admitted shooting the birds last summer. The 10th man admitted hiding the weapons. Sport fishermen and guides on eastern Lake Ontario have long complained that the cormorants are ruining the fishing and threatening their livelihoods. The birds were shot on Little Galloo Island, an uninhabited 52 acres five miles offshore that is the cormorant's principal colony in eastern Lake Ontario, with an estimated 7,500 nesting pairs. Hundreds of the birds were wounded and left to die; many of the hatchlings were left to starve to death. "There is no excuse for the inhumane way in which these birds were slaughtered and left to die," said Ron Lambertson, regional director for the U.S. Fish and Wildlife Service. The defendants could get up to six months of home confinement and fines of up to $2,500 at sentencing Aug. 11. They will also have to donate collectively a tax-deductible $27,500 to the National Fish and Wildlfie Foundation. 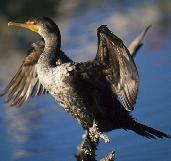 The double-crested cormorant is protected under the Migratory Bird Treaty Act. In December, a state study reported that the cormorant consumed an estimated 87.5 million fish from eastern Lake Ontario in 1998, including 1.3 million small-mouth bass, the lake's most popular sport species. Last month, state officials unveiled a plan to reduce the Little Galloo colony to 1,500 nests within five years by killing adult birds and spraying eggs with oil to suffocate the embryos. But the defendants couldn't wait and instead "acted as vigilantes," said John Cahill, state commissioner of environmental conservation. Defense attorney James McGraw said his clients, Ronald Ditch and his three sons, were pushed by the state's inaction. Ditch has been a fishing guide on the lake for more than 30 years ans saw the birds "cutting into his livelihood, ruining the health of the lake and destroying the local economy'" the attorney said. "They waited and waited and watched the destruction of the fishery. Finally, they did something about it," McGraw said. The Little Galloo Island cormorant colony is going to be reduced either by the illegal actions of vigilantes (gunning) or by the legal actions of state officials (oiling of eggs). The vigilantes killed an estimated 2,000 cormorants in the summer of 1998. NY state officials, according to the newspaper article, plan on reducing a colony estimated at 7,500 nesting pairs (15,000 individuals) to 1,500 nesting pairs (3,000 individuals) in five years, akin to killing 2,400 individual birds per year. So the vigilante fishermen were not far off the mark of the state's official plan. The cormorants have been found guilty of competing with humans for natural resources, and we all know who wins such competitions in the wars and battles of voracious appetites. LONDON, SEPT. 17. Thousands of cormorants are to be shot because British anglers complained that they were eating the fish they wanted to catch. This has enraged the Royal Society for the Protection of Birds (RSPB), which says the species is protected and it will take court action to save them. Ben Bradshaw, the British Minister for Nature Conservation, did not consult the RSPB before announcing yesterday that 3,000 birds a year could be slaughtered. Over six years this would wipe out the British cormorant population, even though the European Union Birds Directive protects the species. The rules permit the culling of up to 300 birds a year if all other methods to scare them away or protect the fish have failed. Now there will be a presumption that the presence of cormorants is leading to fish losses. Growth in numbers There are an estimated 17,000 resident cormorants and 6,000 winter visitors; a big increase from the 1980s, when cormorants were a relative rarity inland, being mostly confined to coasts and estuaries. Heavily stocked trout lakes have provided easy pickings, and the improved quality of rivers and lakes has let cormorants breed. No justification Mark Avery, Director of Conservation at the RSPB, said: ``The Minister has never consulted us about this. There is no scientific justification for this, and we believe it is against the law. ``This is the thin edge of a very thick wedge. Next anglers will be complaining that otters and ospreys are eating fish. Gamekeepers will say merlins are wiping out grouse and farmers complain geese are damaging their crops. The killing season for cormorants will be August 31 to April 15, but this may be extended to May 1 in fish spawning sites. Industrial fishing On another issue the RSPB released a report yesterday on industrial fishing for sand eels in the northeast Atlantic. They are turned into animal feed and pellets for farmed fish.